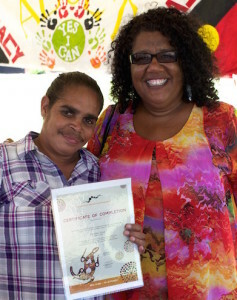 Celebrating achievements at graduation day in Bourke. A whole-of-community adult literacy campaign based on a revolutionary Cuban education method is having life-changing results in Indigenous communities in outback NSW. The first pilot of the Cuban-designed mass literacy education program conducted in Wilcannia in 2012 helped reduce crime and increase school attendance. Now it’s flourishing in Bourke and Enngonia and is about to begin in Brewarrina. 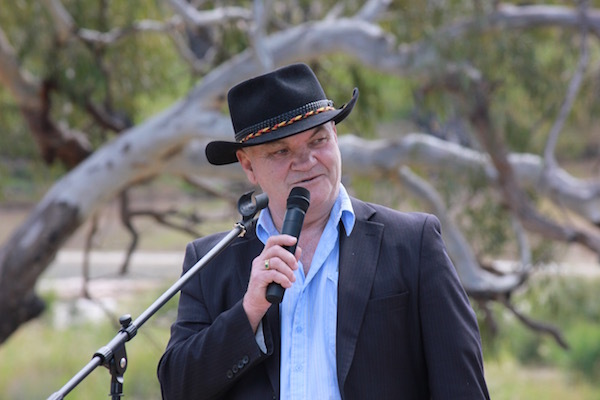 Professor Jack Beetson, Executive Director of the Literacy for Life Foundation, which coordinates the program, says it’s the community’s involvement in the preparation and delivery of the campaign that distinguishes this project from other models and makes it well suited for Indigenous communities. In the second phase, local Aboriginal people who are employed and trained as tutors run 13 weeks of reading and writing lessons for learners based on a set of DVDs. The final stage is 12 weeks of activities to help people consolidate their literacy skills and take next steps – whether it’s to find work, do further training, be involved in providing services to their community or be more involved with their family. Illiteracy rates amongst Aboriginal Australians are estimated at around 40–50% and even higher in some regional and remote areas. Poor literacy adds to disadvantage, making it more difficult for people to find work, manage their health, be involved with their child’s schooling and participate in the management of their communities. Classes aim to bring students to a minimum of level one and a maximum of level two as measured by the Australian Core Skills Framework (ACSF). Part of that responsibility is getting behind any campaign that will help people to learn to read and write. ‘People feel ashamed of not being able to read and write, so learning from your own is very important. ‘Literacy is one of the most empowering things you can give to people,’ Jack says. ‘It gives Aboriginal people the ability to take control of their lives as individuals, families and communities.’ It’s a critical part of breaking down inequality and building a society in which everyone can participate. Literacy for Life began in Bourke in September 2013 and by the end of last year 81 people graduated and the campaign had an 80% completion rate. Eighty per cent of Aboriginal people in court in Bourke are there for traffic offences, usually for driving without a licence. ‘If you can’t read you can’t get a driver’s licence. You also can’t do the training to get an OH&S white card to work in building, mining or construction. Learning to read bridges the gap between unemployment and employment. With a driving licence and white card you’ve got more work opportunities, better quality of life and you’re less likely to end up in court. The local Aboriginal people employed as teachers may be in paid work for the first time in their lives and they love the work because they can see the impact of it every day. ‘The economic consequences are enormous. The jury’s been in for 50 years on the link between literacy and better health. Once people become literate, their health improves. For example, they’re more likely to benefit from medications because they can read the dosage instructions. The Literacy for Life Foundation was formed in 2013 and is a partnership between national health research body The Lowitja Institute, the University of New England, and construction company Brookfield Multiplex.